Not convinced that you can make money from using Twitter? These numbers from Dell might just change your mind. The computer maker says it has pulled in more than $6.5 million in revenue from its Twitter accounts. That's only a fraction of the more than $60 billion Dell made in revenue last year, but it proves that the micro-blogging social network can be a moneymaking machine -- even though it has a relatively small user base. Twitter's user base can't compete with that of Facebook, which was at 350 million at the last count, but the 18 million-strong Twitter community is looking like a more lucrative market for companies such as Dell. 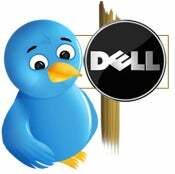 Lionel Mechaca, Chief blogger at Dell, says in a blog post that Dell's (@DellOutlet) main Twitter account now has close to 1.5 million followers. The company announced back in June that the account reached $3 million in revenue. It's now reached $6.5 million, thanks in part to sales from other Dell global Twitter accounts, such as Canada and Brazil. Dell, the third largest makes of PCs, and started using Twitter around two years ago - posting links to offers on refurbished computers and answering customer questions. But Twitter users represent only a portion of the 3.5 million people (roughly the population of Chicago, to put in context) Dell says it reaches through other Web sites as well, such as Facebook, Direct2Dell, and IdeaStorm. With companies like Dell generating significant revenue from Twitter, it will be interesting to see how Twitter itself monetizes this activity. It's been three years since its launch, and Twitter has no apparent revenue model, despite the site's growing success. The company indicated in March that paid accounts are in the works, but there have been no announcements on the progress of this so far.